Most of my previous blog posts on Indian cuisine, well more like all of them, centered around cottage cheese or paneer. I recently came across this new food blog through Jamie Oliver, and it was by this Indian chef and food writer, Maunika Gowardhan. Her site was full of delicious and novel recipes from across India; recipes you definitely won’t find anywhere else, unless they’re passed onto you through your own heritage, if you’re Indian that is. 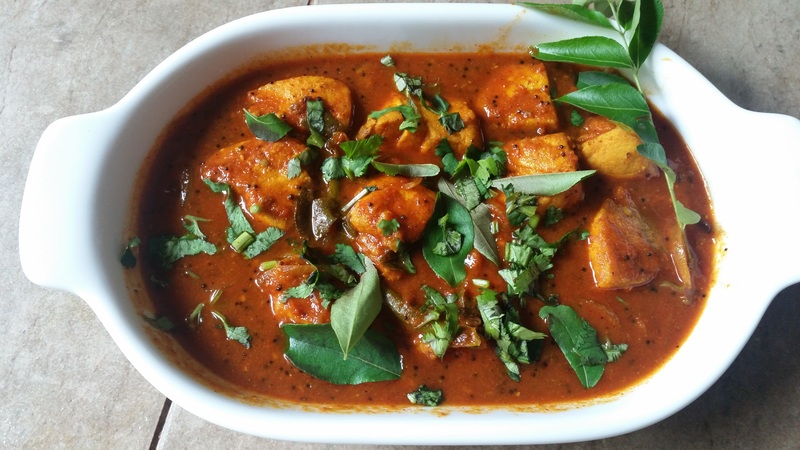 While browsing through her website, simply called Maunika Gowardhan, I came across this recipe for a Spicy Malabar Prawn Curry and I immediately wanted to try it out. The recipe is from the state of Kerala, in Southern India; historically important through the spice trade. Keralan cuisine consists of many seafood recipes, such as the Malabar Prawn Curry, owing to its location along the coast of India. I didn’t have prawns at hand, so decided to substitute with fish instead. I teamed the fish curry, with Bombay Potatoes (also below) and steamed Basmati Rice: perfect for lunch. For the fish curry, I followed Maunika’s recipe as it was, substituting the prawns with fish. I used sailfish, commonly known in Sri Lanka as thalapath maalu. The end result was a fiery, tangy and delicious curry. You could adjust the spice, reducing the amount of Kashmiri chilli powder. 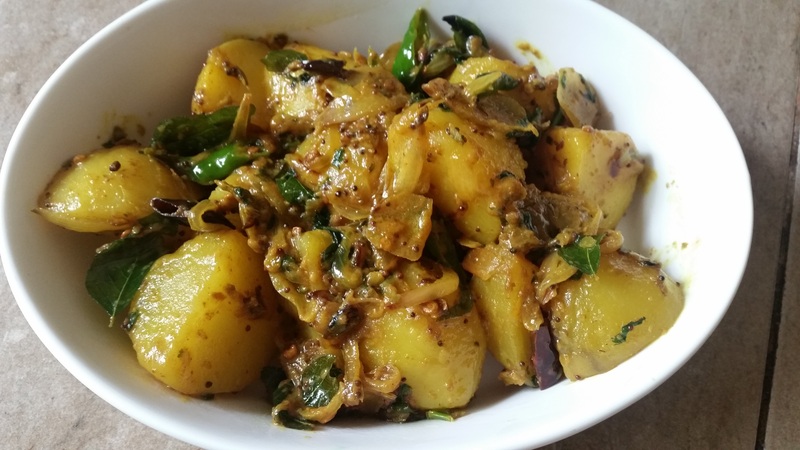 For the Bombay Potatoes, I adapted it from my go-to Indian recipe book- “Best Ever Cook’s Collection: Indian” by Shehzad Hussain and Rafi Fernandez. Boil and peel the potatoes, before dicing them into small pieces. Set aside. In a pan, heat the oil and fry the dry chillies and curry leaves, then add the onions, green chillies, half the coriander, turmeric and spices. Cook until the onions are soft. You may also add some crushed garlic if you like. Add in the potatoes and 1/4 cup of water. Cook on a low heat, for about 10 minutes. Stir well to allow spices to mix. Add lemon juice and salt to taste and remove off heat. Serve garnished with the remaining coriander.